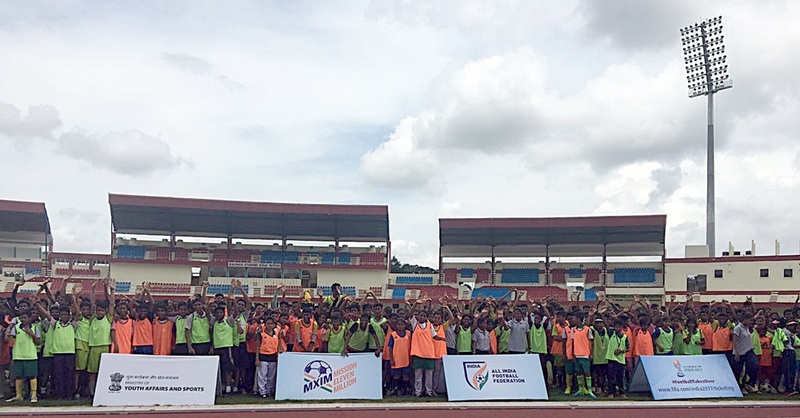 After the Mission XI Million Festival held in Delhi that also coincided with the unveiling of the FIFA U-17 World Cup Official Winner’s Trophy, the MXIM caravan headed east and found itself yet another warm host in Odisha’s capital of Bhubaneswar on Tuesday. More than 1000 kids from schools all over the state came to participate in the festival held at Kalinga Stadium. Footballer Shradhanjali Samantray, the former captain of the India women’s national football team, kicked off the event which had kids participating in small sided games, fun activities and skills workshops throughout the day. The morning heat couldn’t deter the kids as they put on display all the enthusiasm in the world for the beautiful game, giving yet another evidence of how much passion exists for the game at the grassroots level. Also, present on the occasion were Honourable Sports Minister of Odisha Shri Chandra Sarathi Behera and Secretary of Sports Vishal Kumar Dev. Seeing the spirit with which the kids took to the game, Shri Behera heaped praise for the initiative by the Govt. of India and All India Football Federation which seeks to take the game to eleven million kids in the country before FIFA U-17 World Cup India 2017 commences in October. He remarked, “Football is a popular sport in the country and much loved in the state of Odisha. We are absolutely honoured to host the Mission XI Million programme here – the interest that it has generated has been outstanding so far and I am hopeful it will inspire more and more students to pursue the game and take the movement forward in our state too”. With every well attended MXIM festival, the number is slowly inching towards the dream figure of Eleven Million. Project Director, LOC, FIFA U-17 World Cup India 2017, Joy Bhattacharjya said about the programme, “The dream that we had set out on, that of reaching out to eleven million kids in the country with the beautiful game, slowly seems to be coming true and as someone who has closely followed this journey of MXIM, I can’t be happier to see how far we have come. It was a big number we were chasing and it delights my heart to have come this far. It augurs well for the future of the sport in the country”. Mission XI Million, the largest school contact programme undertaken in the country, will reach Guwahati and Lucknow later this month.